“Police Chief Raimundo Atesiano’s actions were intended to give his community a false sense of security and were a betrayal of his oath to protect the residents of Biscayne Park and all the people of Miami-Dade County…” — State Attorney Katherine Fernandez Rundle. A federal court hearing confirmed that former Police Chief Raimundo Atesiano directed three police officers on his department to accuse a series of crimes on three innocent men, all of them Black. In 2013, then Biscayne Park Police Chief Raimundo Atesiano informed community leaders of the Biscayne Park Police Department’s perfect clearance record for solving crimes: It was 100 percent. According to Atesiano, his police department near Miami was perfect at solving burglaries. On Sept. 21, 2018 it was revealed in a plea agreement that the former chief directed his officers to frame unsolved cases on three Black men. A federal court hearing confirmed that former Chief Atesiano directed three police officers on his department to accuse a series of crimes on three innocent men, all of them Black. In August, Biscayne Park Police Officers Charlie Dayoub, 38, and Raul Fernandez, 62, pleaded guilty to falsifying the arrest affidavits for a 16-year-old Black suspect in four break-ins from June 2013.A second false arrest was made on a man named Clarence Desrouleaux. Desrouleaux, 35, was deported to Haiti as the result of being framed and sentenced to five years. A third man, Erasmus Banmah, 31, was falsely accused for burglary. Former Chief Atesiano, 52, pled guilty to conspiracy for the framings. The conspiracy convictions carry up to 10 years in prison. 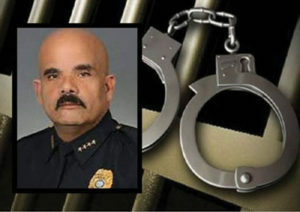 Atesiano resigned from the Biscayne Park Police Department in 2014.The details of the Atesiano framings of three Black men were detailed in a statement released on September 14 by the Department of Justice.